Lionel Messi has responded to the rival fans' cheered after his mesmerizing hat-trick, comprising of three outstanding finishes against Real Betis at Benito Villamarín. The Blaugrana superstar acknowledged the fact that the rival fans gave him a standing ovation after his third goal, courtesy of a stunning chip from the edge of the box over the defenders and the 'keeper. The number 10 of Barcelona was at his scintillating best against the Quique Setién’s side. 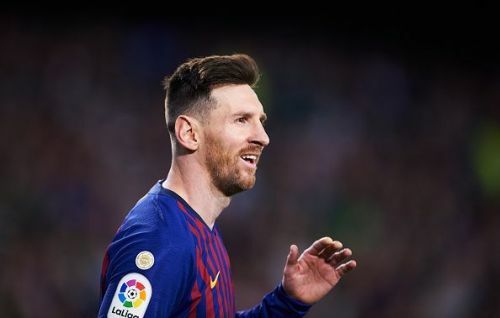 The Barcelona captain scored the 51st career hat-trick and his 33rd in La Liga, which helped the Catalan side to beat Real Betis 4-1 and extend their lead to 10 points in La Liga. Messi opened the scoring in the 18th minute of the game through a stunning free-kick from the edge of the box as he curled it perfectly to the top right corner of Lopez’s goal. Then again, he doubled the lead just before the half time. In the second half, Luis Suarez extended the lead to 3-0 after drifting past three Betis defenders to score a wonderful solo goal. Though Loren pulled one back for Betis to make it 3-1 at the 82nd of the game, the Barcelona talisman had the final say after executing pinpointed chip from the edge of the box, which bounced off from the crossbar before hitting the net to make it 4-1 for Barcelona. After his stunning hat-trick Messi received a standing ovation from the opposition fans. There were also chants of Messi echoing around the stadium. "It's never happened to me before”. "They always treat us very well, regardless of whether we're rivals." "They're a team that treat the ball very well,"
"However, we didn't suffer for a moment; we were very organised. Sometimes we have to adapt our style to suit the opposition, and in specific moments of matches we have to be prepared for anything." Up next, Lionel Messi will join the Argentine set up for the first time in eight months where they will face Venezuela and Morocco in the upcoming International friendlies. Messi will be back in action for Barcelona on the 30th of March to face their city rivals Espanyol.